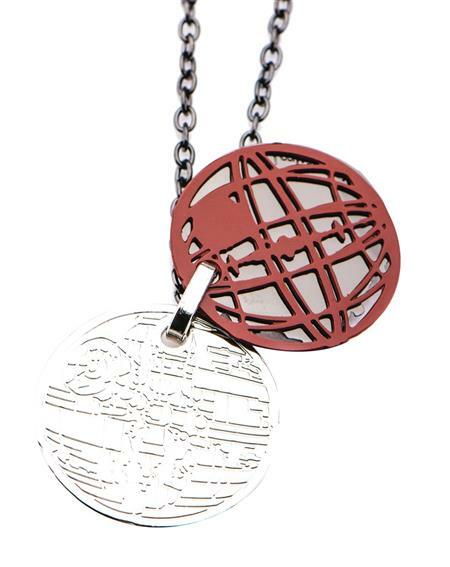 Pay tribute to the last great accomplishment of the glorious Empire with this Death Star Stacked Pendants necklace. Three metal discs, each representing a layer of the under-construction Death Star II, stacked together form a complete and fully-operational battle station. Flip between them to revisit the iconic locations and relive the fateful events of the Battle of Endor. This neckalce features 1' diameter metal pendants on a metal chain with lobster clasp, 21' long, adjustable to 23 3/4' long.